Saturday I took my wife on a cheap date and went to PoCax 2013, the annual sale of postcards by professional dealers and exhibition of postcard collections by members of the South Jersey Postcard Club. I spent over an hour panning for gold among the thirty-four tables filled with boxes and boxes of postcards hoping to discover a new image of Riverton. Lora Moore of Moore’s Postcard Museum, greeting people at the reception table at the entrance of the large conference room that held the event, introduced herself to me when she saw me signing in. I have used a few borrowed images from her website to illustrate posts on this one (with her permission), and it was nice to put a face to the name. Her fascination with postcards started with a box of old cards that had belonged to her great-grandmother. Now with a collection of thousands of cards, she tells visitors to her blog about paper, postcard, and ephemera shows and the cards she has acquired. 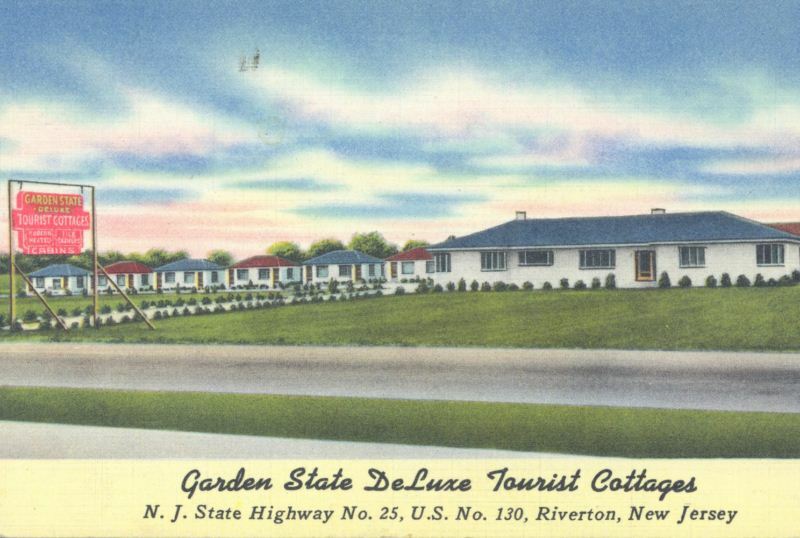 I grew excited when I found a dealer with a handful of cards in the section of his box marked “RIVERTON.” My hopes almost faded when I sifted through the stack and only found Garden State Motel and Kern’s Tourist Home – did someone print like a million of these? But, what’s this? A few precious nuggets soon surfaced. I scored a RPPC, or real photo postcard, of Bank Avenue, another one of 3rd and Main Streets, and an Olds Community postcard showing a 1955 Oldsmobile Super 88 Holiday Sedan. At another table I found one more view of Bank Avenue. Afterwards we went to Amy’s Omelette House in Cherry Hill to eat. Linda picked it because she heard that the décor makes use of old postcards. Hundreds of old-time post cards and lots of retro fifties advertising art cover the walls and border the booths. All I could think of was I’d like to scan all of those postcards. See, it was a date with a theme. We came to Amy’s for the novelty, but our service was great and the food was memorable. Linda had a vegetarian cheese omelette (one of the 200 varieties of omelettes they serve) and I had 8-grain stuffed French toast with strawberries, honey, and granola. I am not invested in Amy’s, but I just wanted to pass along the information about this unusual eatery with the nostalgic vibe to any postcard collectors in the neighborhood. At home later, I scanned the postcards into my computer. But the three RPPCs were never mailed. How old are they? Coincidentally, my regular sale alert email from Scview Antique Images contained some helpful information for dating RPPCs and I used it to date these postcards. It turns out that the stamp boxes and backs of the cards are the keys to fixing approximate dates for real photo post cards. I hope that Santa treated all of you boys and girls of all ages well this year, as he did those of us at our house. 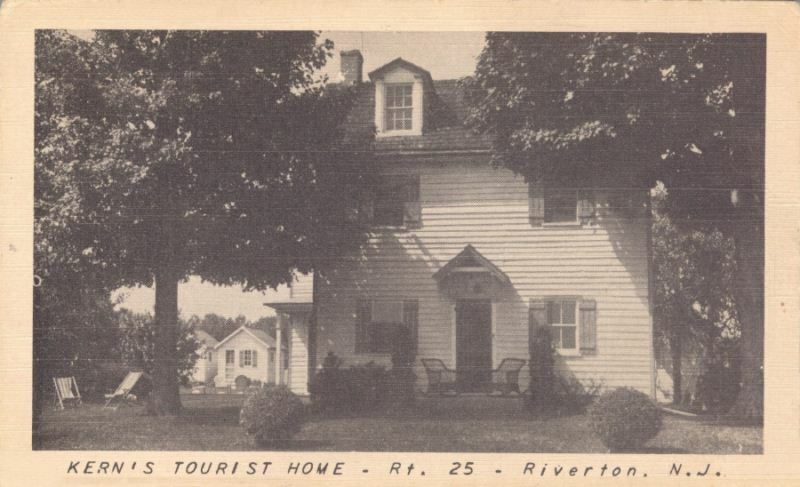 There is one item left under the tree that you may find yourself enjoying throughout the New Year, particularly if you are a former resident of the Riverton-Palmyra-Riverside area and you care to keep tabs on goings on in your old hometown. Just in time for 2012, The Positive Press, a free community newspaper published in Riverside, has recently become available online. True to the newspaper’s commendable title and masthead declaration, “HOMETOWN NEWS DELIVERED FREE TO EVERY HOME IN THE TRIPLE TOWNS,” publisher/editor Regina M. Collingsgru dispatches neighborhood news for Riverside, Delanco, Delran, Palmyra, Riverton, and Cinnaminson with a decidedly upbeat tone. Well… that’s five towns. Even better. This month’s 40 page ad-supported December 2011 issue is fairly typical of the enjoyable monthly publication whose objective is to print only positive news and stories. Inside, readers will find community news, human interest stories, articles by several historical societies, news of interest to veterans, plus school, church, and senior news, and a community calendar of upcoming events. Especially noteworthy features include the eighth monthly serial installment of Joseph P. O’Donnell’s “The Shoe Leather Express,” the inspiring story of survival and valor of World War Two prisoners of war, and “Back in Time,” Will Valentino’s popular nostalgic column which looks back fondly at Palmyra’s yesteryear. The online edition further includes more information and photos that didn’t make the paper due to timing or space limitations. A cool value-added benefit for advertisers is the extra online exposure to potential customers that includes a link back to the company’s website. P.S. I recently blogged at length about the our December 3rd Museum for a Day, but HSR President Gerald Weaber also posted a story about our one-day show at the New Leaf from his perspective along with 40 image photo gallery on the Programs & Events page here.